A couple of years ago I had the brilliant idea to write a one-of-a-kind book on the subject of purposeful aging. Knowing I’d need a publisher’s advance to support the research and travel required for the book, I wrote a proposal for it and sent it to prospective literary agents in the hope that one of them might open the right door for me. I’ll never forget a conversation I had with a New York agent willing to take my call after I’d sent her my proposal. On the phone she sounded like an older woman herself, someone who’d been around the block in her business, straightforward, but not (exactly) hard-hearted. In a gravelly New York accent she gave me this piece of advice: “Dahling,” she said, “forgettaboutit.” She paused to let this sink in. “Do you know how old the decision makers at the big publishing houses are these days?” she asked me. I knew she was only one person with one point of view, but what she said to me was enough to halt my purposeful-aging-book dream in its tracks and make me take another tack. I decided right then to create this WOW Factor blog and write short, inspiring posts on the subject of aging, as the spirit moved me, and offer them freely to whomever cared to read them, in the belief that every little bit of inspiration helps. Then last week my friend Becky loaned me a new book she’d been given, A Modern Woman’s Guide to Aging: Together We Consider Our Options, by Claire Haye; and I read it right away. 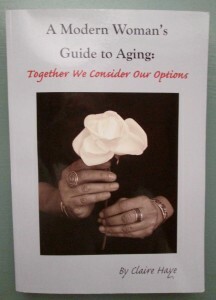 What a pleasant surprise for me to see that Haye has written and published the book on aging that I’d hoped to write! And she’s done a better job of it than I think I could. It’s always fun to have a laugh-out-loud moment while reading a potentially earnest book such as this, so I must share my “lol” experience here. In Chapter Four, “Together We Search for Meaning and Purpose,” Haye offers some of the environmental and psychological factors that statisticians say increase life expectancy: Education, Money, Status, Marriage, Being a Catholic Nun, Winning the Nobel Peace Prize, and Living in Minnesota. “Shall we all become nuns and move to Minnesota?” she asks. “Only if we truly love Jesus and ice fishing,” she answers. Claire Haye, 69, is a widow, the mother of two grown daughters, a self-supporting visual artist and jewelry designer in Taos, NM, and now the author of this wonderful book. If I were the author of A Modern Woman’s Guide, I’d be extremely proud. Perhaps the decision makers in New York’s publishing world might be too young to recognize its value, but every woman old enough to be their mother would see it differently. In my view, this Guide is a necessary addition to every thoughtful older woman’s library. For more on the Guide, visit: www.amodernwomansguide.com. Note: For each sale of the Guide, Haye will contribute $5 to the charitable fund, Making it a Better World for Women and Children.